Our latest and oldest Single Grain whisky shows the classic hallmarks of that unusual style. Lighter in body than Malt whisky, but with no lack of flavour or character, this is full of nutty wood-sweetness. Labouriously polished wood on the nose lifted by hints of kirsch and citrus peel. Reminiscent of sugar cane on the palate except with nicely balanced tannin from the decades in oak. Turning 40…? Think you know old whisky….? Expand your palate/horizon with this old beauty. Robert Whitehead, BBR Spirits Specialist Sometimes known as Strathmore, North of Scotland distillery was converted from the old Knox Forth brewery in 1957. Initially there were plans to make Malt Whisky but this was shelved and the distillery produced Grain spirit until it closed in 1980. The distillery was demolished during the early 1990's. There is much bourbon cask influence on the nose with some deep coffee notes, honey, peach and apricot. The palate bursts with sweet fruit and builds with layered intensity. The finish is long and soft with a little balancing spice. 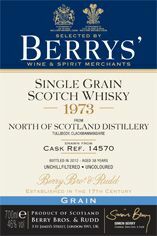 The North of Scotland distillery was opened in 1958 at Tullibody, Clackmannanshire. The distillery made from converted brewery buildings, with the intresting twist that it initially produced Malt Whisky and Grain Whisky from the same column stills. This proved to be rather unsuccessful and so after only a few years production was switched to just Grain Whisky. The distillery was closed in 1980 and finally totally dismantled in 1993. While Malt Whisky can only be made from barley, Grain Whisky is made from a mixture of grains, typically wheat and maize (corn) and it may also contain barley. Grain whisky is distilled in a continuous column still, also known as Coffey still. Coffey still distillation is generally accepted to yield lighter and less complex flavour than pot still distillation (distinctive to malt whisky). In Scotland, pure Grain Whisky is seldom bottled, it is typically used in the production of blended whiskies that combine grain and malt whiskies. Occasionally well-aged grain whiskies are released as "single grain whisky". Scotland is the home to 6 grain distilleries: Cameronbridge, Girvan, Invergordon, North British, Port Dundas and Strathclyde. Together they annually produce six times the amount of malt whisky. Only three of the aforementioned distilleries bottled their own single grain whiskies: Cameron Bridge, Black Barrel (from Girvan) and Invergordon. Find out about other whisky styles in the dedicated pages for Single Malt Scotch Whisky (Lowlands, Highlands, Speyside, Islay, Campbeltown, Orkney, Skye, Mull, Jura, Arran ), Blended Whisky , Vatted Malt Whisky (aka Blended Malt), World Whiskies that includes Irish Whiskies, Japanese Whisky and American Whiskey and Bourbon.